they say god doesn’t give you more than you can handle, well, i’m being REALLY pushed to my limits. i can honestly say i’ve been pushed well passed my limits. i take it in stride. mostly, laughing or throwing a self-deprecating comment out there. but it’s starting to get old. why doesn’t anything just go smoothly for me? i know i’m sensitive, i know that i need to grow a thicker skin. but others see it too now, and i think they feel pity for me. or maybe it’s that they feel sympathy. which sadly enough IS helpful because to live your life constantly being tested is painful. the past month was been wretched. 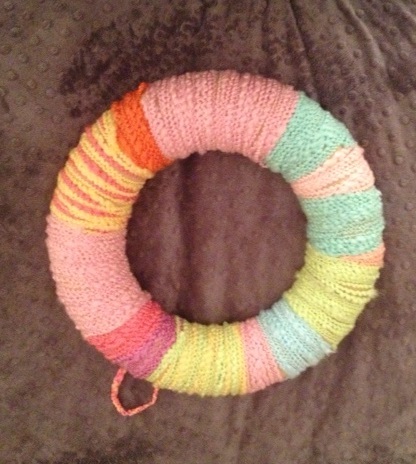 the Easter wreath i bought that brought new meaning when i was awaiting a baby and now hurts too much to look at. someone else will have to enjoy it next year, i don’t ever want to see it again. on march 3rd my world as i had grown to plan it was changed within minutes. april just began, a new month. a month thought of as the sign of springtime of renewal. of new life and new beginnings. i will try to leave this bad attitude behind. i will try to leave my hurt behind. i will try to move forward and know that somewhere out there ARE the answers as to why all of this has happened how it has, and someday i will know what that is. and until then, i just have to live through it and live life to its fullest. i’m not a religious person but the past month has made me really turn to my faith and my beliefs. it brings me comfort to believe in a higher being. it’s brought me comfort to believe that there was a purpose behind what happened to me and the loss that i’ve felt. i believe that god has a plan for me…..i just don’t know what it is yet. and i’m not very patient. You are way more patient than you think you are, Traci. May God continue to bless you with strength to go through whatever he has laid ahead for you.